Shane Gebauer explains all the best and needed techniques for installing package bees. You will see the entire operation from start to finish, up close and personal. Once you watch this DVD you will always look forward to installing packages. This one-hour presentation gives an excellent look at artificial insemination, grafting queen cells, and the basics of a queen rearing system. Queen of The Sun: What Are the Bees Telling Us? is a companion book to the critically acclaimed film of the same name. Compiled by the film's director Taggart Siegel, it makes a profound examination of the global bee crisis through the eyes of biodynamic and organic beekeepers, scientists, farmers, philosophers, and poets. Revealing the mysterious world of the beehive and the complex social community of bees, the book unveils millennia of beekeeping, highlighting our historic and sacred relationship with bees, and how this is being compromised by highly mechanized and intensive corporate agribusiness practices. The bees are messengers and their continuing disappearance is a resounding wake-up call for humanity. With full-color, stunning photography throughout, this engaging, alarming, but ultimately uplifting anthology begins with an account of how Siegel's film came to be made. It continues with a wealth of articles, interviews, and poems that offer unique philosophical and spiritual insights. "In this post-varroa, post-Colony Collapse Syndrome era, beekeepers everywhere are developing localized, mite-resistant bee stocks. Key to this is their ability to raise queen cells and queens. Bee Culture/American Bee Journal author Larry Connor describes a very successful queen rearing method using Starter and Finisher colonies. The book is organized as follows: Queen and Colony Evaluation, Queen Marking and Clipping, Biology of Cell Production, Cell Starting, Making Queen Cells, Cell Development, Cell Finishing, Drone Production, Nucleus Production/Cells, Evaluating New Queens, and Cells and Queens Only - A look at a large-scale queen operation. "Detailed and practical manual" A "must-have for every beekeeper" filled with "astounding photographs.""--Amazon. Beekeeping is a sixteen-billion-dollar-a-year business. But the invaluable honey bee now faces severe threats from diseases, mites, pesticides, and overwork, not to mention the mysterious Colony Collapse Disorder, which causes seemingly healthy bees to abandon their hives en masse, never to return. In The Quest for the Perfect Hive, entomologist Gene Kritsky offers a concise, beautifully illustrated history of beekeeping, tracing the evolution of hive design from ancient Egypt to the present. Not simply a descriptive account, the book suggests that beekeeping's long history may in fact contain clues to help beekeepers fight the decline in honey bee numbers. Kritsky guides us through the progression from early mud-based horizontal hives to the ascent of the simple straw skep (the inverted basket which has been in use for over 1,500 years), from hive design's Golden Age in Victorian England up through the present. He discusses what worked, what did not, and what we have forgotten about past hives that might help counter the menace to beekeeping today. Indeed, while we have sequenced the honey bee genome and advanced our knowledge of the insects themselves, we still keep our bees in hives that have changed little during the past century. If beekeeping is to survive, Kritsky argues, we must start inventing again. We must find the perfect hive for our times. For thousands of years, the honey bee has been a vital part of human culture. 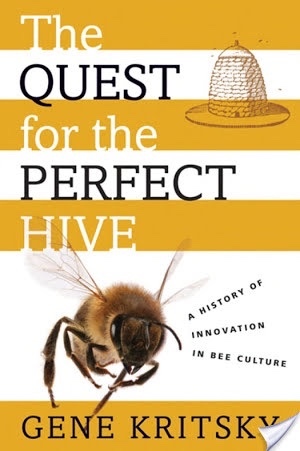 The Quest for the Perfect Hive not only offers a colorful account of this long history, but also provides a guide for ensuring its continuation into the future.